Rodeo Clown Behind Obama Skit Is Banned From State Fair : The Two-Way The fallout continues from Saturday's performance, during which the clown in the "Obama" mask and others mocked the president. Politicians from both sides of the aisle have condemned the act. Rush Limbaugh, meanwhile, puts part of the blame on the president. 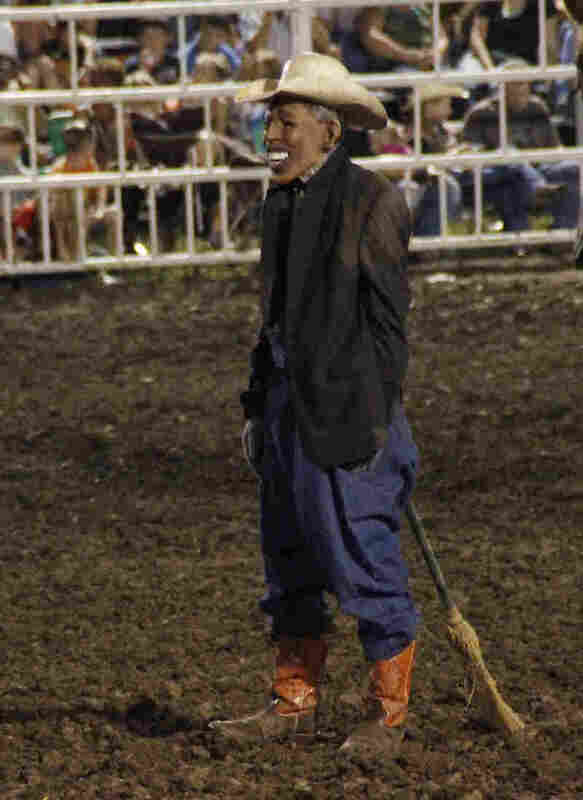 Missouri State Fair officials have now banned the rodeo clown who wore a President Obama mask during was responsible for a performance that mocked President Obama. Fair officials also say they are reviewing their contract with the Missouri Rodeo Cowboys Association, which ran the event, and that the association's personnel and performers must undergo sensitivity training if they are to work with the fair again. That association, meanwhile, has issued a statement saying it wishes to "extend a sincere apology for the inappropriate act during the Bull Riding at the Saturday performance of the MRCA Rodeo." If you haven't heard, we posted Monday about the outrage and apologies that followed what happened at the fair Saturday. As videos taken by a spectator showed, then-Cowboy Association President Mark Ficken (the announcer at the event) could be heard saying that Obama was "gonna have to just stay there." A clown (possibly the man in the mask) could be heard saying that a bull was coming for "Obama" and that "he's gonna getcha, getcha, getcha, getcha!" According to a spectator, one of the clowns "ran up and started bobbling the lips on the mask and the people went crazy." A performer also said of Obama, "I know I'm a clown, he just run [sic] around acting like one [and] doesn't know he is one." Several news outlets have identified the performer in the Obama mask. The St. Louis Post-Dispatch, one of those outlets, quotes a relative of that man as saying the clown's act was "entertainment. ... He's supposed to make the crowd laugh, and just like those shows, he made the crowd laugh." NPR has not independently confirmed the clown's identity. According to the newspaper, Ficken's attorney says his client has quit as the Cowboy Association's president. A photo taken of the clown who wore a mask resembling President Obama during a rodeo Saturday at the Missouri State Fair. Meanwhile, conservative radio host Rush Limbaugh said Monday that Obama is partly to blame. The Los Angeles Times writes that Limbaugh said, "When the president of the United States more often than not connects with the American people on late-night comedy shows ... what else can happen other than the diminishing of the office?" Watkins, the attorney for Ficken, has issued a statement saying that his client wants to "set the story straight." "He was as surprised as anyone with the appearance of an Obama-masked rodeo clown," said Albert S. Watkins, legal counsel for Mr. Ficken. Ficken's sole reference to the clown was to say, "Watch out for that bull Obama!" In a video recording posted by a spectator you can hear the announcer say: "Let me tell these people about who we got helping. Obama's gonna just have to stay there. Obama, watch out for those bulls." Note at 2:35 p.m. ET, Aug. 14: Tuffy Gessling, the clown at the center of this controversy, has now told a Missouri news outlet that it was another man who was in the Obama mask. But Gessling says the skit was his idea, that he made most of the comments and jokes that the crowd heard, and that he's responsible for the incident. You can read more about all that here. Because of this new information, we've edited our headline. It originally said: "Rodeo Clown Who Wore Obama Mask Is Banned From State Fair." We've also tweaked the text of this post. We've used strikethroughs in the line that has been edited.